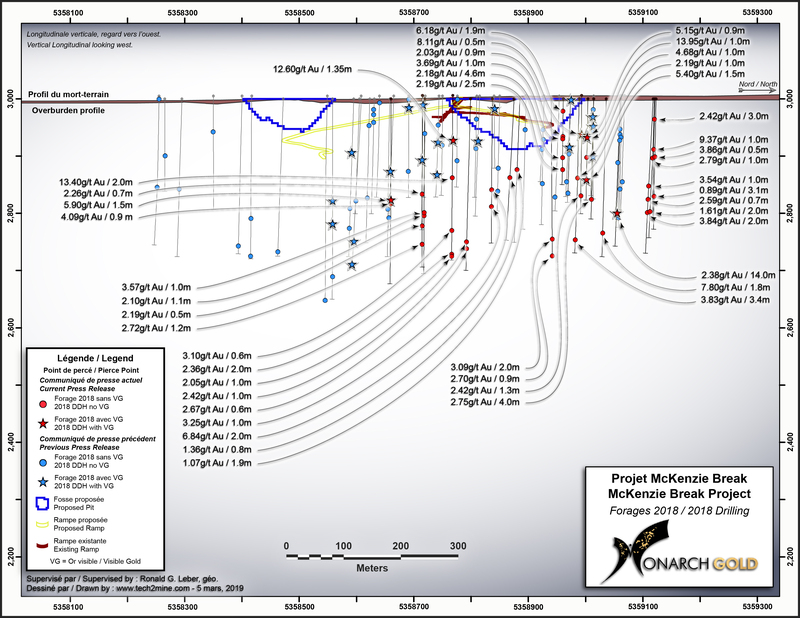 Montreal, Quebec, Canada, March 20, 2019 – MONARCH GOLD CORPORATION (“Monarch” or the “Corporation”) (TSX: MQR) (OTCMKTS: MRQRF) (FRANKFURT: MR7) is pleased to report the third and last set of assay results from the 2018 diamond drilling program at its wholly owned McKenzie Break gold project 25 kilometres north of Val-d’Or, near its Camflo and Beacon mills. The program started in September 2018 and ended in December 2018, with a total of 13,945 metres drilled in 61 holes. The purpose of the program was to explore below the known lenses and on the periphery of the multi-vein Green and Orange zones. Assays have been received for the last 20 holes totalling 5,052 metres of core (see table below and press releases dated February 28, 2019 and March 13, 2019 for a compilation of the 2018 assay results). 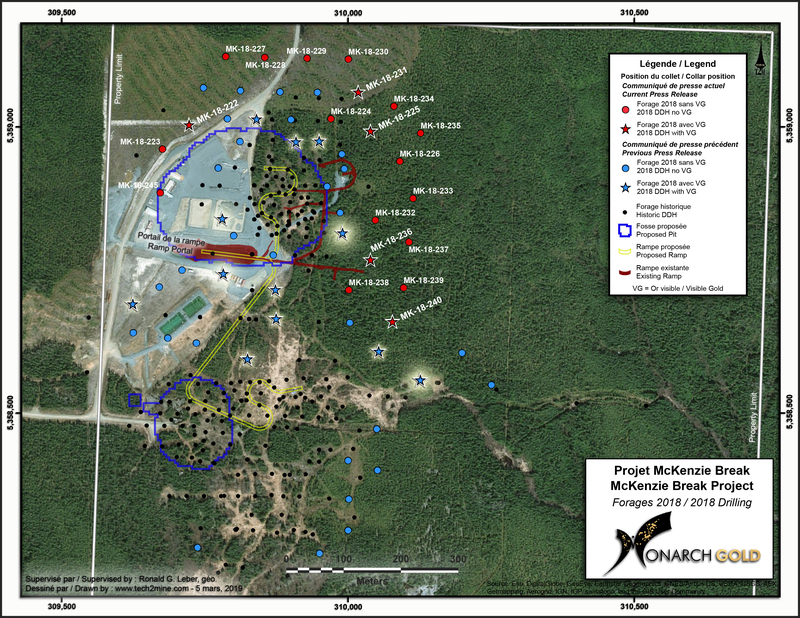 McKenzie Break is a high-grade, multiple-narrow-vein gold deposit hosted in the dioritic Pascalis batholith and underlain by porphyritic diorite and mafic and felsic volcanic rocks. On June 14, 2018, the Corporation reported an NI 43-101 pit-constrained resource of 48,133 ounces in the Indicated category and 14,897 ounces in the Inferred category on the property, as well as an underground resource of 53,448 ounces in the Indicated category and 49,130 ounces in the Inferred category, for a total of 165,608 ounces of gold (Source: NI 43-101 Technical Report on the McKenzie Break Project, April 17, 2018, Alain-Jean Beauregard, P.Geo., and Daniel Gaudreault, Eng., of Geologica Groupe-Conseil Inc., and Christian D’Amours, P.Geo., of GeoPointCom Inc.). Sampling normally consists of sawing the core into equal halves along its main axis and shipping one of the halves to the ALS Minerals laboratory in Val-d’Or, Quebec for assaying. The samples are crushed, pulverized and assayed by fire assay, with atomic absorption finish. Results exceeding 3.0 g/t Au are re-assayed using the gravity method, and samples containing visible gold grains are assayed using the metallic sieve method. Monarch uses a comprehensive QA/QC protocol, including the insertion of standards, blanks and duplicates.